Each week, I've put out a scouting report on the Patriots upcoming opponent, going over their personnel, tendencies and how the Pats might matchup on game day. There won't be a bigger game than this one, as the Patriots will take on the Falcons in Super Bowl LI. Legacies will be at stake here, particularly for Tom Brady, who can essentially cement his status as the G.O.A.T. while also sticking it to the league and it's disgrace of a commissioner in one fell swoop with a win. To do so, however, the Pats will have to beat an Atlanta team that steamrolled through a loaded NFC field thanks to a record setting offense and a young, fast defense that has played it's best football of the season over the past month. Given the gravity of this matchup, I've split my scouting report into two posts. After looking at their offense yesterday, I'm turning my attention today to their defense, which has shown great improvement as the season has progressed. Lets not mince words; Atlanta hasn't had a particularly great, or even good, defense in 2016. A quick glance of the numbers reveals that, as they rank in the bottom 10 of the league in many statistical categories, including points (25.4 per game, 27th) and yards (5,939, 25th). Much of this can be attributed to youth, as the Falcons are currently slated to start four rookies in the big game, along with three more second year players. However, Atlanta has shown improvement and appear to be peaking defensively at the right time. Over their past six games, they've held opponents to just 19.3 points per game, with Drew Brees' Saints the only team in that span to score over 21 on them. Like the Patriots, those numbers are fluffed up a little bit by feasting on the bad offenses of San Francisco and Los Angeles, but they've also backed it up in the postseason with consecutive solid showings against Russell Wilson and Aaron Rodgers. The Patriots are nothing if not prepared for Atlanta scheme-wise. Atlanta's head coach, Dan Quinn, was the Seahawks defensive coordinator in the last Super Bowl the Patriots played in. Quinn was hired by the Falcons following that game and has implemented the Cover 3 scheme that Seattle popularized around the league. As Bill Belichick has noted, the personnel and some of the tendencies are different, but the scheme is largely the same. I wrote extensively on how to attack the Cover 3 in the build up to that Seattle-New England Super Bowl. Essentially, the boundary corners and deep free safety split the field into deep thirds, while the linebackers and strong safety drop into underneath zones. Those boundary corners are responsible for anything deep along either sideline, with the free safety (Earl Thomas in Seattle) responsible for anything that gets behind the underneath zone defenders in the middle. It's a scheme designed to take away the deep ball, forcing the quarterback to check down to receivers in the dangerous underneath zones, which are filled with lurking defenders. Like any scheme, this defense can be manipulated if the quarterback is able to sit in the pocket and allow downfield routes to develop. Tom Brady rarely had that luxury against Seattle thanks Michael Bennett, who was a disruptive pass rushing force throughout the game. Atlanta's odds at slowing Brady down go up dramatically if they are able to affect him with pressure. If Brady is well protected, their young secondary will likely be toast. Atlanta was one of the worst teams at generating pressure during the regular season, but they've really turned up the heat in their two postseason games. Part of that has been due to a heavy influx of blitzing, which is a dangerous strategy to implement against a notorious blitz killer in Brady. However, some of it has also come from improvement from their young personnel, with second year man Grady Jarrett particularly showing up as an interior rusher. 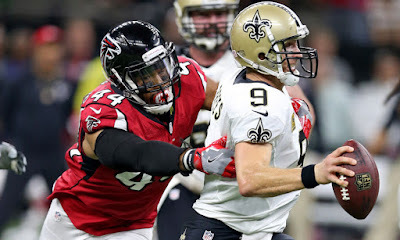 The biggest name of Atlanta's pass rushers is Vic Beasley. 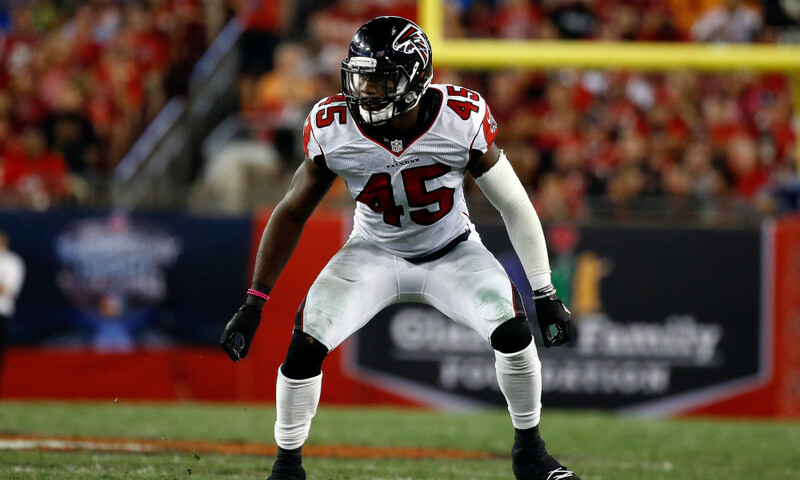 The eighth overall pick in 2015, Beasley disappointed in an injury-riddled rookie season last year, but turned around to lead the league in sacks in his second season. While Beasley's speed off the edge can be devastating, he's also a bit of a one-trick pony whose stats were fattened noticeably against a handful of bad quarterbacks and tackles. He lines up almost exclusively at left defensive end, leaving Marcus Cannon with the assignment of preventing him from a blindside, turnover risking hit on Brady. Beasley has been helped quite a bit by the mentorship of future Hall of Famer Dwight Freeney. The Falcons have carefully managed the 36 year old's workload, picking their spots to play him on key passing downs. He's responded well, flashing the form that made him one of the league's most dangerous pass rushers. He still has that famous spin move in his arsenal. You can be assured that Brady, who was one of Freeney's most frequent targets during his heyday with the Colts, will adjust his protection schemes accordingly when Freeney is in the game. While none of the Falcons other pass rushers are terrifying, there's some solid players to account for. Grady Jarrett's lack of prototype size led him to fall in the 2015 draft despite a great college career, but he's been a solid pro who appears to be improving by the day. While undersized, Jarrett uses his leverage and quick first step to be disruptive on the interior, both against the run and the pass. Think of a poor man's Geno Atkins. Other talented players include veteran outside linebacker Brooks Reed, who has had a number of productive seasons in his six year career, and Ra'Shede Hageman, a high second round pick from the 2014 draft. Hageman was considered a boom or bust prospect with immense upside, drawing Richard Seymour comps during the process as a two gapping 3-4 end with pocket collapsing potential. He's been too inconsistent to live up to those expectations in his three seasons, but the flashes have been there. His pure power and size (6'6", 318) makes him a tough matchup for Joe Thuney and David Andrews, both of whom struggle at times against bigger, more powerful players. The rest of the Falcons defensive line rotation consists of role specific players. Tyson Jackson, a former top 3 pick of Chiefs, serves as a run stuffer and veteran presence in this young group. He's a respected veteran, but his effectiveness appears to be diminishing in his eighth season. Jonathan Babineaux, on the other hand, has been primarily used as an interior pass rusher. An 11 year veteran and career Falcon, Babineaux has long been a productive player, but his production fell off a cliff in his age 35 season. At defensive end, former second round pick Courtney Upshaw is in the rotation along with Beasley, Freeney and Reed. Upshaw was a better as an edge setting run defender than as a pass rusher in Baltimore, but has almost been exclusively used as a rotational rusher in Atlanta, with predictably poor results. The Falcons maximize the effectiveness of their lineman with a liberal rotation, which the Patriots could take advantage of with their up tempo offense. This could particularly be effective when certain players are in the game. For example, the Falcons try to keep Beasley and Freeney off the field in obvious running situations; the Patriots could counter by going no huddle to keep them on the field before running right at them. In fact, running right at them could be a good strategy to use in general against these Falcons. The Falcons were a weak run defense in 2016, as only five teams allowed more yards per carry than their 4.5. Despite this, the Falcons were middle of the pack in terms of yardage, surrendering 104.5 per game. They can thank their offense for that, as teams were often forced to abandon the run against them due to playing catch up against their prolific offense. Only the Steelers, Cowboys, Titans and your Patriots faced fewer rushing attempts per game. This could be a good game to feature LeGarrette Blount and the power running game. Not only are the Falcons soft in the middle of their defensive line, but they are also undersized at linebacker, where they start two rookies. Both rookie starters are well above average athletes for the position who play hard downhill, but both Deion Jones (6'1", 222) and De'Vondre Campbell (6'4", 232) are the type of linebacker who would rather run around a blocker than take him on. If the Patriots can keep those two from shoot gaps and hitting Blount in the backfield, they should be able run effectively, as Blount will be able to power through them for significant yards after contact if he's meeting them at the second level. Establishing the power running game would have several benefits. For starters, it would allow the Patriots to control time of possession, minimizing the amount of opportunities Matt Ryan's dangerous offense has to hurt them on the other side. It would also open up a litany of scheme opportunities in the passing game, some of which could really be advantageous against an Atlanta defense whose youth could be exposed by Brady in certain situations. Take play action. Establishing the run early should draw a reaction from said linebackers, who prefer to use their speed to their advantage by attacking downhill. Draw them in with a play fake, and you could have an opportunity for a big play down the seam. Those aggressive tendencies could also be taken advantage of with misdirection concepts, which the Patriots use often to keep the opposing defense off balance. Whether they go run heavy early or not, this Patriots passing game should be able to find mismatches against Atlanta's secondary. With top corner Desmond Trufant out for the season, the Falcons feature plenty of youth in the defensive backfield. Now in his fourth season, 2013 second rounder Robert Alford is the veteran of the Falcons cornerback group. 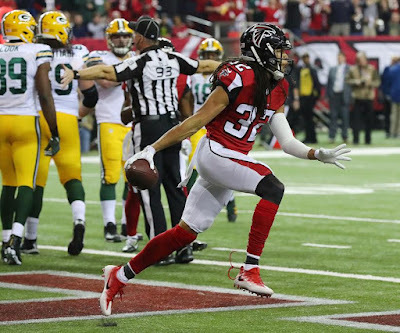 He's flanked by 2015 second rounder Jalen Collins and undrafted rookie Brian Poole, who has emerged as an unexpected contributor in the slot. The long lanky Collins was a high second round pick due to his immense potential, but he failed to make an impact as a rookie and started his sophomore season with a four game suspension for violations of the league's substance abuse policy. He didn't even play during his first four games back from the suspension, but the injury to Trufant opened up a starting job that Collins seized and never looked back. Collins is built like the prototypical "Seattle" cornerback and plays like one, using his size and length to steer outside receivers to the sidelines. On the other side, Alford also has plenty of athleticism but has been a bit of a trick-or-treat type of corner in his career. He has two picks this season, one of which was returned for a touchdown, and an impressive 19 passes defensed, but also gave up plenty of big plays and was one of the most frequently flagged corners in football. Like Seattle, Atlanta's corners like to play physical at the line of scrimmage, and Alford can give up big plays quickly when he misses his jam. Little was expected of Poole, who went undrafted out of Florida largely due to his lack of size (5'9", 210). However, he's been a revelation at slot corner, earning a role from Day One and many one of football's most difficult positions competently as a rookie. His lack of height has gone largely unexposed in the slot, where he typically faces smaller, quicker receivers, and he's become a force blitzing from his slot position. While there's plenty of physical talent here, there's also plenty of inexperience to pick at. The Pats could also take advantage of the Falcons matchup-wise, as their corners typically defend the same side rather than traveling with an individual assignment. For example, the Patriots could try to match Julian Edelman up against Collins, who is better suited to covering bigger and faster deep threats than the cat-like quickness Edelman brings to the table. They could also use either Chris Hogan or Malcolm Mitchell in the slot to take advantage of their height advantage against Poole. The Falcons have been better at safety, where first round pick Keanu Neal has been effective right off the bat in the Kam Chancellor strong safety role. Another rookie from Florida, Neal isn't as big as Kam, but he plays with the same hard-hitting ferocity as a de-facto extra linebacker in the box. Neal has also done a good job covering tight ends, which will be an important role in this game against Martellus Bennett. Bennett looked as healthy as he has in a while against the Steelers in the AFC Championship game (he certainly looked healthy dancing to Whitney Houston afterwards) and his balky ankle has had two weeks to rest. While this matchup looks like a draw on paper, the Patriots could use Neal's aggressiveness against him to create an opportunity for a Bennett big play down the seam. 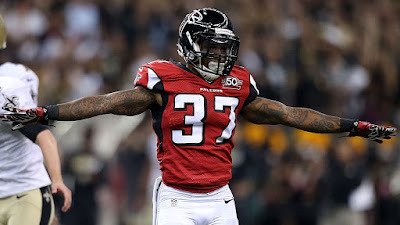 Neal is the bigger name due to his draft status, but the most important role in the Cover 3 has been manned impressively this year by Ricardo Allen. A fifth round pick in 2014 as a college corner, Allen converted to free safety and won the starting job in 2015 after essentially red shirting his rookie year as a game day inactive. He was good in 2015 and has been better this year, using his range as a former corner to snuff out big play opportunities from his centerfield spot. He doesn't make as many impact plays as Thomas does in Seattle (who does? ), but he's played his uber important role well in Atlanta. Without his emergence, their scheme doesn't work. Still, any Cover 3 safety, even the best ones, can be exploited by play design if the quarterback is protected. I highlighted one such play design in my film breakdown of the win over the Steelers. The Steelers play came against what appeared to be Cover 2 and had the additional wrinkle of starting as a run look before both LeGarrette Blount and James Develin motioned to split out wide. However, the core play design was a classic Cover 3 beater. The outside receivers run short hitches to occupy the boundary corners assigned to them, while a slot receiver from either side runs a simple go route up the seam. This can put the lone deep safety in a real quandry, as he must pick one route to cover, leaving the other potentially wide open. Other zone beating concepts include "flooding the zone" with receivers, essentially singling out an individual zone defender and forcing him to commit to one of two routes in his assigned space. The Pats did this time and time again against Seattle in that Super Bowl, create just enough space underneath for Brady to efficiently check down all the way down the field during his magnificent fourth quarter comeback. I highlighted examples of this concept in my breakdown of Seattle's Cover 3 in the build up to that Super Bowl. When zone is run effectively, it can be an effective counter to man beating counters such as bunch formations and crossing routes, both of which are a staple of the Patriots offense. However, Atlanta's youth shows up from time to time in poor communication when passing on a crosser from zone to zone. That could be deadly against the Pats, who have used Edelman in particular to great effect on such routes, including on a big opening drive spark against the Steelers. While the Falcons will predominately stick with their bread and butter Cover 3, they've shown a willingness under Quinn to mix in man coverage looks, particularly when the zones aren't working. I could see them doing this more than expected in this Super Bowl, as Quinn knows as well as anyone that it's essential to mix up your coverages against a master like Brady. If they do go to man coverage looks, the Patriots should be able to mismatch them both with their personnel and with the aforementioned "man beaters" (bunch formations, crossing routes, etc) that make up a good chunk of their playbook. The Patriots will take Edelman one on one against any of the Falcons corners and should be able to create other favorable matchups against man coverage. While the Falcons linebackers are fast, I'd take the shiftiness of Dion Lewis against either of them one on one any day. 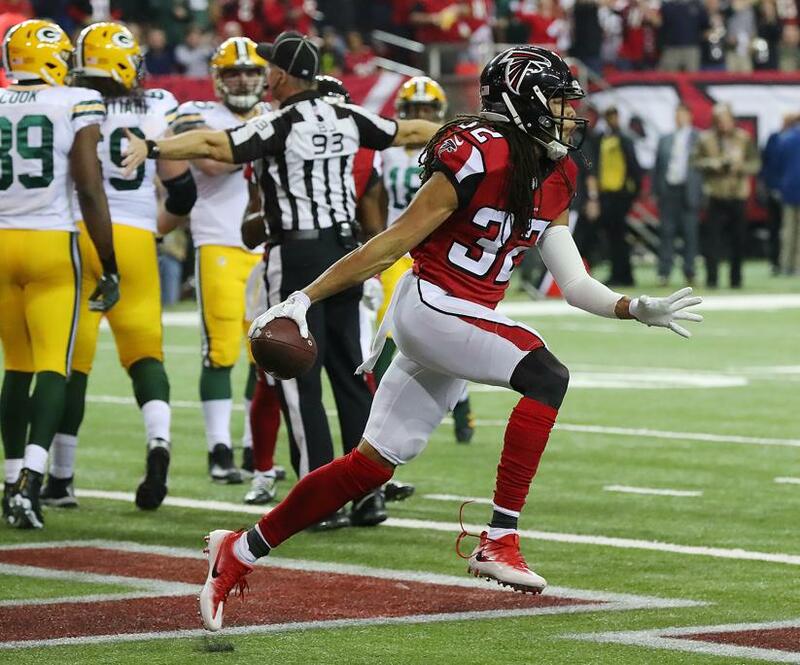 While not one of the league's elite units, Atlanta's special teams have reliable gotten the job done for them all season long. Special teams were consistently a strength for the Seahawks, and Quinn has brought that level of emphasis on the game's third phase to his Falcons team. Return specialist Eric Weems has helped to get the prolific Falcons offense good starting field position. A 10 year veteran, Weems has long been one of the league's better return men. He backed up that reputation with another solid season, especially on punts, where he averaged 11.4 yards per return. Weems didn't bring any returns to the house this season, but he did have a career long 73 yard punt return, along with a 42 yard kick return. 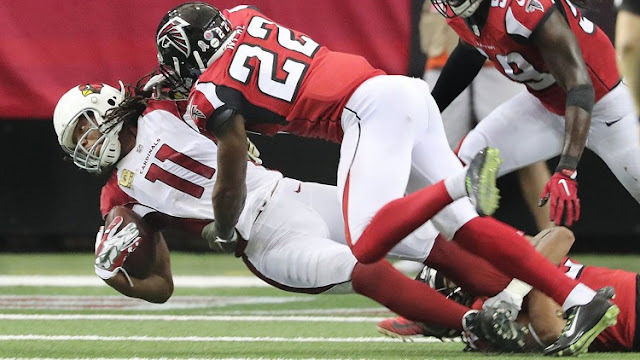 Weems maintained a perfect season of ball security while helping the Falcons start their average possession on the 29.8 yard line, the seventh best mark in football. The Falcons also have steady veterans at the kicking positions. The 41 year old Matt Bryant remained as good as ever in his 15th season, making all but three of his 37 field goal attempts on the season. Two of those misses came from beyond 50 yards, where he still made a respectable six of eight attempts. At punter, Matt Bosher finished yet another steady year in his sixth season with the Falcons. The weakest aspects of the Falcons special teams has been their kick and punt coverage, but even those units haven't been bad enough to be considered a liability. Opponents averaged solid numbers per punt return (9.6) and kick return (22.6), allowing them to start their average drive at the 26.4 yard line. While they weren't particularly stingy, they didn't let up many big returns either, and have kept opposing returners out of the end zone all season.